This course is designed for anyone with a reasonable chance of encountering bloodborne pathogens such as: Correctional Officers, Childcare workers, Security Guards, Maintenance workers, School personnel, Hotel Housekeepers, Health and Fitness Club Staff, or Tattoo Artists. This course is designed to meet Occupational Safety and Health Administration (OSHA) requirements for bloodborne pathogens training when paired with site-specific instruction. 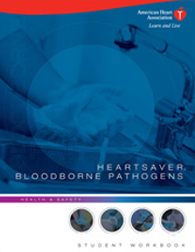 The HeartSaver® Bloodborne Pathogens course teaches students how to protect themselves and others from being exposed to blood or blood-containing materials. Continuing Education Hours: The American Heart Association has been accredited as an Authorized Provider by the International Association for Continuing Education and Training (IACET). The American Heart Association is authorized by IACET to offer 0.50 Continuing Education Units (CEUs) for the initial online course. A renewal online course option is not available at this time. The American Heart Association HeartSaver Bloodborne Pathogens course completion card is valid for two years.